SOUR ROT is a term that sometimes is used to describe a general decay of nearly-ripe grape clusters that may be associated with various bacteria, yeasts, and/or filamentous fungi that are not species considered to be primary decay pathogens, e.g., Botrytis cinerea, Colletotrichum spp., Greenaria uvicola, etc.. Unfortunately, this means that different people (and in the United States, various fungicide labels) often use this one term imprecisely to refer to a condition that has different causes. For this discussion we will define sour rot as a syndrome that involves pre-harvest cluster decay accompanied by the smell of vinegar (acetic acid). The characteristic visual symptom of sour rot is a tan to occasionally reddish discoloration of the rotting berries, which eventually lose their integrity and begin to decompose, and no moldy growth needs to be present. 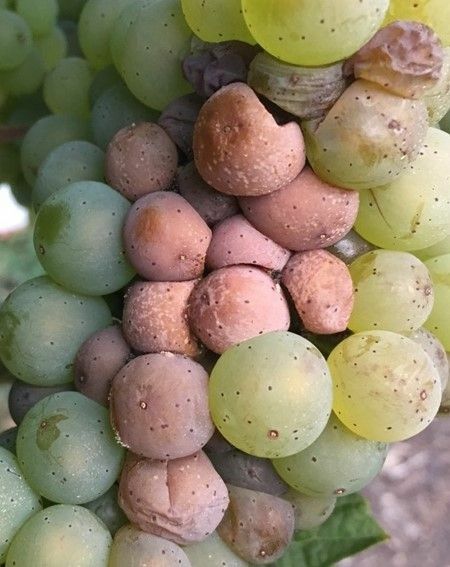 Whereas various molds, including Botrytis, are sometimes found on sour-rotted clusters, these organisms are not necessary for sour rot to develop. Although some potential role for them in specific cases cannot be dismissed entirely. One additional group of organisms characteristically associated with sour-rotted clusters, which are highly visible and appear to be an important if not essential component of the disease, are Drosophila “fruit flies” or “vinegar flies”, as discussed later.